For our 57th large permanent replica, we go back to Germany, southern Germany in the state of Baden-Württemberg, near the city of Ulm, to the town of Ermingen, where there is a longstanding, possibly ancient tradition of beacon burning on the first Sunday of Lent. Since this site, on a prominence with a clear view in all directions, needs to be kept clear for the beacon, someone came up with the idea of placing stones to track the movement of the sun. And once you bring up the concept of tracking the sun with stones set in the ground, it’s never long before someone mentions Stonehenge. Hence this rather nice if odd trilithon. That lintel looks like a little cap, doesn’t it? Herr Thom has posted a nice video of the stone circle and a walk through the trilithon. Click here to see it. Nicely done! 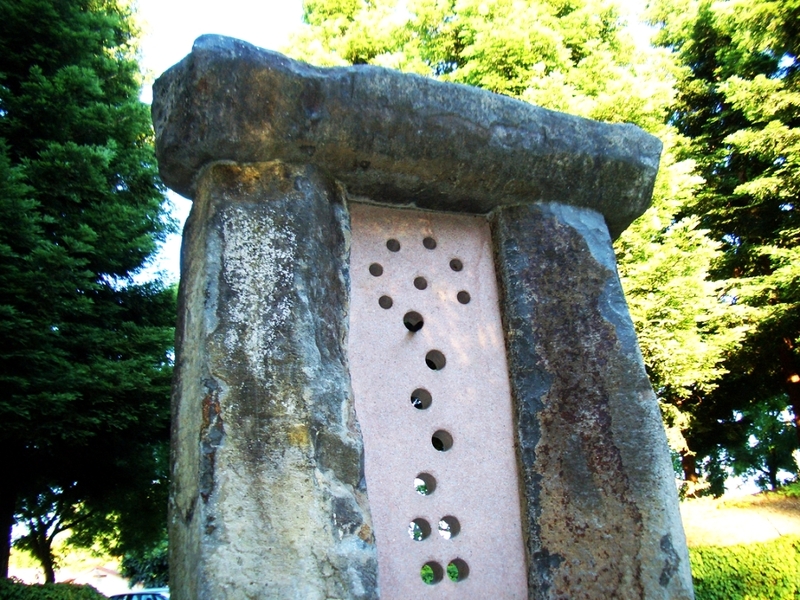 Translation of the caption there includes this: “On the days of the summer solstice and the winter sun turn within the stone circle determined points are illuminated by the stone gate through of the sun.” At certain times of the year the sun shines through the trilithon onto special points within the circle. Ermingen, by the way, is known among fossil buffs as the site of the Turritellenplatte, a unique outcropping of rock rich with fossils of Turritella, a kind of mollusk shell. We don’t know whether any of that rock was used for this structure, but if it was, we would approve. That fossil/megalith connection is in need of strengthening. Ermingen is also surrounded by many ancient sites, including a cave, Hohle Fels, that is thought to have been inhabited as early as 30,000 years ago. Found there so far were a Venus figurine and bone and ivory flutes, the earliest musical instruments ever found. Brilliant stuff! Let’s go visit! Score: 6 druids. We like the site, we like the beacon, a very old way of communicating, and we like the fact that there’s a circle rather than just a trilithon. Now we wonder what new large permanent replica will pop up next! Clonehenge is one year old today. Happy birthday to us! To celebrate we will list a few of our favourite smaller and/or temporary henges, starting with the celebratory cupcakes above, which we posted back in March. Have one, gentle reader! Another henge we liked was this cell phonehenge, a creation of the great henging enthusiast Simon W. Burrow. We would have to check, but this may be the only small henge that got 8½ druids. Unfortunately it seems that his photos and brilliant captions for this are no longer on Flickr. Next we have to put a mention in for the smallest henge, a nanohenge made in Singapore by scientists testing a silicon micromachining process. They made a Stonehenge replica–what else?! That was one of the first ones we posted–November 24, 2008. Seems like eons ago. It was only a few months ago, in August, that we posted the mosaic fruit jelly henge on the occasion of our 200th post. Made by The Cookie Shop, a blogger in Brazil, it has to be the most colourful and attractive to the eye of all the mini-Stonehenges we posted. Yes, it’s just trilithons, but it’s candy for the eye. Foodhenges have been among our favourites all along. Certainly baconhenge has been popular with readers. Carol Squires, its creator, and Carin Huber, who first blogged it have made a contribution to the visibility of henging, especially home food henging, on the web. It is among the best known of online henges. And we can’t forget the Lego Doctor Who! What a great, strange, and twisted concept! The good Doctor encounters the Secret of Stonehenge, courtesy of thegreattotemaster, up there in chilly Iceland. There are many other great and odd henges to choose from– tamponhenge, packing foamhenge, the charming fairy Stonehenge, and the well-sculpted butterhenge. But our number one temporary homemade henge is Clark Perks amazing full-size Stonehenge replica made of wooden frames covered with plastic garbage bags, built in just a few days at Bennington College in Vermont. The page he wrote about it is worth a click and read. In a way it embodies the spirit of Clonehenge! And sadly we’ve found many excellent Stonehenge replicas that we haven’t been able to bring to you because we didn’t get photo permissions. Some, like Clotheshenge, were so good that we posted links, but for the most part we just let them lurk on the web for you to stumble upon one day and think of us. For now, we’re thinking that a year is enough to dedicate to something like this. We will still post when something comes up and we certainly plan to judge and post the Clonehenge contest entries, but we plan to take a break from the long hours of searching for new things to post. We think we’ve made our point–people everywhere are making Stonehenge replicas out of everything. Why? Maybe someday someone will do a graduate thesis on that and use Clonehenge as a resource. We hope so. People just laugh and shrug it off, but we think there’s something going on here that bears examining. That said, we’ll part with links to a few nice replicas. First one of the best of the virtual 3-D Stonehenges, a small replica at a small school (scroll down), a toothpaste henge with ghost table cloth, and a smallish Australian gardenhenge that is great and somehow very funny at the same time. It’s the pansies that do it! There are loads more out there. We’ll still post when someone send a good one in or when we hear of one we think bears mentioning, for example if Ross Smith in Australia ever releases photos of the one he was threatening to make. So let’s toast to a year of Stonehenge replicas. How about some Dom Perignon, Clonehenge-style? Cheers! 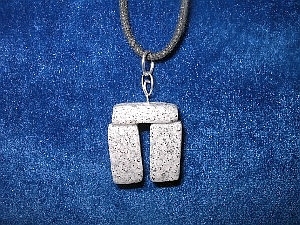 Wearing Stonehenge: Show Your Love with Tiny Megaliths! It’s getting toward the gifting season (groan! ), so here’s a fun little set of items for any Stonehenge enthusiast on your gift list. We were impressed with these because most earrings out there that are being called Stonehenge earrings bear no resemblance whatsoever to Stonehenge. These are rather nice little trilithons of spotted stone (okay–in the real Stonehenge it is the short bluestones, not the tall sarsens of which the trilithons are made, that are spotted, but we’ll let that pass because we like the look). And there’s the nice little pendant to go with them. The whole set would go well with an outfit of solid black, or a wardrobe of solid black if you’re that sort. We can’t help but imagine these finding their ways onto the ears and chests of cute little wannabe Wiccans who have glittery moon tiaras and only a dim concept of Stonehenge that somehow involves Druids and Irish music or bagpipes although they’re not sure why. But quite serious archaeologists who know about Beaker folk and the cursus and what-not might wear these earrings, too. The stone shapes and proportions are well done and there’s an off-balance sense about them that echoes the cobbled-together look of the real monument. Score: 6 druids, because good Stonehenge jewellery is hard to come by. Sadly for our Stateside readers, the website selling them is in the U.K. So far we haven’t found anything comparable on Etsy. By the way, this site also sells small Stonehenge candle holders and even little witches hung from strings to hang from your ceiling or perhaps your . . . ahem . . . Yule tree. And that’s only on their Stone Age/Pagan/Celtic page. Who knows what joys await? Happy winter solstice shopping, or whatever you like to call it! And believe us, there are more where that photo came from, whether you fancy the costumes or the girls! Look at this fellow, and these two. Many more photos scattered about the net, and some of the greatest costumes we’ve ever seen! Do an image search and you’ll see. What? Oh, yes, the Stonehenge. First take note of what appears to be Ogham, a medieval Irish alphabet, cut into the “stone” on the right side of the trilithon. An odd detail, but there’s always a new wrinkle in any Stonehenge, it seems. We like this photo, with musicians making music around the stones. The connection between Stonehenge and music seems natural. Research has been done about that, but since it was done at the Maryhill replica, we’re not sure how accurate it is. People say the Maryhill replica is a lot like the real Stonehenge, but you only have to look at it to know it’s not. The stone shapes and the concrete materials are too different. The music connection, however, is unavoidable. Many albums and CDs feature Stonehenge on the cover. Of course there’s Spinal Tap. And Oxegen in Ireland, the music festival we would most like to attend, features a Stonehenge-like portal for its entrance way. Portal is perhaps the operative word. The trilithons at Stonehenge look like portals, as if one could stand in the center and walk out into a different world or another different world, depending which one you walked through. Music at its best serves a similar function, opening temporary new worlds or sometimes new doors in our everyday world, bringing the transcendent to the mundane. Or–that could be hogswallop. After all, we’re just bots! It appears to be a handsome thing and the object, apparently, is to create the equivalent of the complete outer circle of Stonehenge by manipulating those steel bars with that magnetic wand. The lingering question, of course, is: Then what? But with two sets, of course, you could begin to do something a little more accurate. Please note, it says “Made in England” and then, “Nashville, Tennessee.” This is an intriguing item and we would be curious to see one in the hard copy world. The other item here is a more complex educational set made for children. The copy reads, “Create a miniature sunrise with your solar motion compass and chart the stars path with a solar calendar and working sundial. Either of these could give an adult and a child a fun day thinking about Stonehenge, its form, its possible functions, and who built it. With the first, you could also talk about magnetism. With the other, you could also talk about astronomy. And with either, a creative person could take it further. Score for the first, 4 druids. For the second, 5½ druids. These are just two examples of hands-on model sets generated by Stonehenge one way or another. That mysterious urge to re-create it comes through in every form and size, with many new conceptions of the Stonehenge idea yet to emerge. What brings people back to it again and again, recreating the ancient monument in ever newer ways, no two alike? We like to think that this collection we’ve created here at Clonehenge may help to bring us closer to an answer. If not, at least it brings us to another, equally important question: Aren’t people, well, a little weird? Just sayin’. We have noticed an influx of new visitors. We invite you to explore. We’ve posted well over 200 henges, large and small. If you want to find the nearest one to visit, check out the list of large permanent replicas. We also have many foodhenges (cheesehenges, butterhenges, candyhenges, even a cheese puff henge) and beautiful museum models of Stonehenge, Avebury and Silbury Hill, along with many other beautiful and ridiculous (okay–we do lean more heavily toward the ridiculous!) Stonehenge replicas, models and sculptures. Try the search function at the right or click on any term in the Words in Use cloud further down the page. We’re always looking for additions to the blog–replicas you know of or have made (Or will make! For us!). Read The Rules of Henginess page to get an idea of what we’re looking for. For why we’re doing this and how we got started, read Clonehenge, the Interview and/or Why, You Ask? Well, It’s Like This. And, yes, we do address the topic of Spinal Tap! More than once. Questions and comments on anything here are welcome. Thanks for dropping by the oh-so-terrific fabulousness that is Clonehenge!